This inexpensive pdf clocks in at 8 pages, 1 page front cover, 1 page SRD, leaving us with 6 pages of content, so let’s take a look! 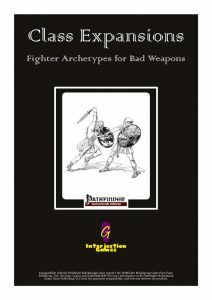 The first archetype herein would be the battle hipster (fighter), who is a specialist of the bladed scarf and thus begins play with proficiency in it. Additionally, we get a +1 natural armor bonus when wearing an undrawn bladed scarf in the neck slot. Instead of 1st level’s bonus feat, observers need to succeed a Perception check to notice the nature of a bladed scarf – the DC is based on class levels, fyi, and the DC is lower if the character attempting the skill check is proficient in the weapon. 2nd level allows the battle hipster to use the bladed scarf as a bed roll, a 20-ft.-rope or as a 10-ft. ladder. Also at 2nd level, the archetype learns to inflict the weapon’s base damage die + enhancement bonus in slashing damage when tripping/disarming foes with it, which also increases by +1 at every 4 levels thereafter. This replaces bravery. 10th level adds the option to use this in conjunction with grapples. 5th level provides the ability to meditate for one hour on a bladed scarf, attuning it – each attuned weapon is treated as though it was a +1 weapon (increasing by +1 every 4 levels thereafter): Interesting: These stack with existing bonuses and allow the battle hipster to even add special weapon qualities to the bladed scarf. And yes, the +5 cap remains intact and the verbiage gets the requirement of at least a +1 right. Attunement may be ended as a standard action that provokes AoOs or by being separated. Really cool: Attuned special weapon abilities on such a scarf suppress the special weapon quality of other weapons within 30 ft. – really like that one! 9th level locks the battle hipster into flail training and these two abilities replace weapon training 1 – 3. 6th level provides meteor stance – as a swift action, he may choose the properties of the bladed scarf, making it gain reach, but losing the disarm and tripping capabilities of the weapon while holding it thus. At 20th level, the archetype is locked into bladed scarf as weapon mastery choice. Next up would be the javelineer fighter, who increases the range-increment of weapons that can be thrown by +10 ft. and may draw javelins as though they were ammunition. Starting at 2nd level, the javelineer generates 5 javelins each morning, +5 for every 4 levels beyond 2nd. These may not be sold or stockpiled – neat catch! Additionally, at this level, javelins no longer net the character a non-proficiency penalty when used in melee. At 5th level, javelins thus fabricated gaina +ü1 enhancement bonus, increasing by +1 every 3 levels thereafter, capping at +5. At 4th level, the archetype, when hitting a shield with a javelin or other thrown spear, halves shield bonuses to AC, as the spear is stuck in it – the penalty thus incurred is not cumulative and stuck spears may be removed as one standard action per spear. This replaces 4th level’s bonus feat. 5th level locks the archetype into weapon training with the spear-group; no others may be chosen, but every 4 levels thereafter, the bonus increases by +1. Similarly, 20th level locks the archetype into the spear group for weapon mastery. At 8th level, the javelineer may sunder at range with thrown weapons from the spear group, ignoring the javelin’s enhancement bonus in hardness. At 9th level, when performing a full attack and starting it off with a ranged spear, all subsequent attacks may be performed with ghostly duplicates of this first thrown spear, which is potent and somewhat solves the cost issue. 13th level nets Shot on the Run, usable for spears exclusively. Purifiers are mace/Morningstar/light hammer specialist fighters – instead of weapon training, the weapons burst into flame, dealing an additional 1 fire damage, which increases to 1d4 at 5th level, +1d4 at 9th level and every 4 levels thereafter. On crits, this added damage is maximized. Fire damage thus caused ignores fire resistances of undead, evil outsiders and evil dragons, with 13th level allowing the purifier to ignore even fire immunity of these creature types. At 2nd level, the purifier may, as a standard action or in place of a main-hand attack of a full attack, while wielding the archetype’s preferred weapons, hurl flames at a creature within 60 ft., inflicting the weapon’s base damage die fire damage on successful hits. Special weapon abilities apply to this and similarly, the aforementioned bonus fire damage is added to the assault, though RAW, the resistance/immunity ignoring component is not gained by the ability, which makes going into melee still potentially the preferred strategy – nice. This replaces the bonus feat at 2nd level. At 6th level, instead of a bonus feat, the purifier may, instead of a melee attack, touch himself with the flames, gaining ½ class level temporary hit points that last for a round. 10th level nets consuming purity, which replaces the bonus feat and makes creatures that take fire damage from the weapon also catch fire – fire damage thus dealt ignores resistance and immunity of the aforementioned creature types. Starting at 14th level, upon reducing an enemy creature of the undead, evil outsider/dragon types to 0 hp, he may fling flames as a free action, swift action if the target was weak, preventing undead kitten-abuse. The capstone adds 20 fire damage on crits, which, once again, ignores immunities and resistances of the noted creature types. The archetype comes with two feats – one that replaces fire damage with cold damage for all class features and one that lets you add a type chosen from favored enemy’s lists to the creatures that are affected by the flames/cold of the archetype. Quartersawn sluggers are a more complex operation, gaining their own class table, with full BAB-progression, good Fort-saves and spontaneous spellcasting governed by Cha of up to 3rd spell level, with spells drawn from the sorcerer/wizard list. The archetype may only learn single-target spells with a casting time of 1 standard action or less and they may never cast spells directly into creatures, instead being limited to cast them into spell storing weapons – as a minor formatting complaint, the special weapon ability’s not italicized in the text. Quartersawn sluggers do not suffer from arcane spell failure when wearing light or medium armor and using a shield (excluding tower shields). Spells with somatic components still have spell failure when cast in heavy armor or while using a tower shield. This replaces armor training. The archetype begins play with the ability to meditate on a wooden club or greatclub, attuning it in a process that takes 1 hour. The attuned weapon gains the spell storing weapon special ability. Starting at 7th level and 15th level, the quartersawn slugger can maintain an extra attuned club, respectively. Starting at 5th level, the archetype’s locked into hammers for weapon training, and does not gain other weapon trainings, instead increasing the bonus granted by +1 every 4 levels after 5th. Similarly, 20th level locks weapon mastery into club or greatclub. The final archetype herein would be the trick slinger, who is, surprise, the sling specialist in this pdf. Instead of the bonus feat gained at 1st level, the archetype may choose a variety of sling tricks whenever he gains bonus feats: These sling tricks modify shots fired with slings and sling gloves; 1/round, you may declare an attack to be a sling trick and only one sling trick may be applied to a given attack. Rapid Shot’s additional attack can, just fyi., not be a trick shot. The trick shots presented include increased range increments, causing bleed damage (ouch! ), ignoring Dex-mod DR (excluding DR/epic), ricochet…some nice ones here! When dealing 0 damage or missing, you can add a second attack at a different target at -2 to atk…and there is the option to cause somewhat splash-like damage with shattering sling bullets. There is also an option to attack touch AC, but also losing ability modifier to damage with such a shot. 5th level once again provides the specialty weapon training with scaling bonuses. Slightly confusing at first glance: This ability and all subsequent abilities are formatted as though they were sling tricks, not regular archetype class features. 9th level increases the number of trick shots per round to 2. 13th level allows for a full attack with a thrown weapon using sling bullets as a standard action, but at -5 to all attacks. 17th level nets basically a flurry with the sling at -2, stacking with Rapid Shot. 20th level auto-confirms sling crits and increases damage multiplier by 1. The archetype comes with a feat that unlocks trick shots for weapons using sling bullets that are not slings or sling gloves. Editing and formatting are as tight as we’ve come to expect from interjection Games; while the pdf does sport a few formatting hiccups, none impede the rules-language provided for the archetypes. Layout adheres to the classic, nice 2-column b/w-standard and art is fitting public domain stock. The pdf has no bookmarks, but doesn’t necessarily need them at this length. Bradley Crouch is an excellent designer; his take on some of the more maligned weapon choices makes that evident at a glance. The material presented is nice, has some cool visuals and offers interesting playing experiences, all for a very low and more than fair price point. While the cosmetic formatting hiccups are slightly annoying, the more than fair price does make up for them. Hence, my final verdict will clock in at 4.5 stars, rounded up for the purpose of this platform.